Sorry ladies, no more rides on Space Mountain for you! Ric Flair is officially off the market. The WWE/WCW legend tied the know for the fifth time on Wednesday at a resort in Rosemary Beach, Florida. 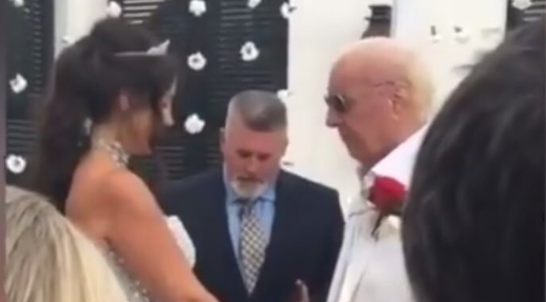 In true Ric Flair fashion, he walked down the aisle in a custom-made white suit while ‘Ric Flair Drip’ played over the speakers. He and his longtime fiancée Wendy Barlow had been dating for more than six years, but have known each other since Flair’s wresting days in the WCW as she performed as Fifi the French Maid during the early 90’s.